It was Huxley who reminded us that science is nothing but trained and organised common sense. That this uncommon commodity is often lacking in the investigation of alleged abnormal phenomena is only too apparent to those engaged in serious psychical research. The work of great psychists like Wallace, Crookes, Lodge, and Richet is convincing only because we know that their methods and records are those of the trained and scientific worker. The most convinced spiritualist will, I am sure, be the first to admit that much of the work of the old-time investigators is valueless owing to the inadequacy of their methods and the incompleteness - or total lack of - detailed records. Some spiritualists affect to despise the scientific side of the subject, but it is noticeable that whenever their leaders wish to appear convincing - either on the platform or in their literary work - they invariably fall back an the scientist and scientific experiments for their proofs and evidence. Even the Roman Catholic Church is asking the scientist to put his cachet on the miracles of Lourdes and similar alleged manifestations. In a recent speech the Pope said that the Roman Catholic Church did not fear scientific investigation with regard to miracles, but on the contrary, as science helped to establish miracles. To conduct scientific experiments one must have apparatus and recording instruments and suitable accommodation in which to use them. There are very few psychic laboratories in existence. The principal is at the Institut Métapsychique International, Paris, where, under the guidance of Dr. Eugene Osty, some excellent work is being done. Dr. Baron A. von Schrenck-Notzino, of Munich, has a laboratory where psychic history has peen made with Eva C., Willy Schneider, and other mediums. At Munich, too, is the laboratory of Herr Karl Krall, who came into prominence at Elberfeldt before the war with his calculating horses, Muhamad, Zarif, Hanschen, find Barto. In Berlin is the laboratory of Professor Sehröder, who purchased many of the instruments, etc., of the late Fritz Grunewald, who died in 1925. In Vienna, Professor Dr. Hans Thirring has adapted the University physical laboratory for psychic experiments; and something similar has been accomplished by Professor Dr. Chr. Winther, of Copenhagen. America does not - as yet - possess a psychic laboratory. In Great Britain, prior to the founding of the National Laboratorv of Psychical Research, there existed no laboratory devoted solely to psychic experiments; it was for this reason the National Laboratory was inaugurated. The National Laboratory of Psychical Research possesses the finest installation in the world for experimental research work in the field of psychic science. No expense has been spared in equipping the Laboratory with every scientific instrument which will be used in experiments capable of exact measurement. The Laboratory occupies the entire suite on the top floor of 16, Queensberry Place, South Kensington, London, S.W.7. A lecture hall (capable of seating about 200 persons), reading room, tea room, lavatories, etc., are also available for members of the Organisation. The Laboratory suite consists of six rooms, viz. : Laboratory, séance room, baffle chamber, workshop, dark room, and office. The baffle chamber is a narrow apartment separating the laboratory from the séance room. This arrangement serves two purposes: it enables apparatus, etc., to be transferred from. 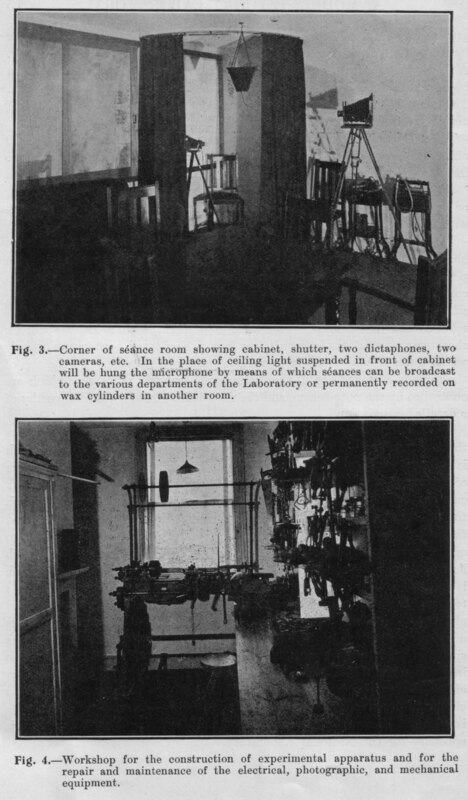 the laboratory to the séance room - or vice versa - without the admittance into the séance room of unwanted light during the experiments. The small chamber also prevents sounds in the laboratory from reaching the séance room. The situation of the suite is ideal for research work, the rooms being quiet and secluded. Enamelled name plates on the doors designate the various departments. Yale locks are on all the doors, which can also be sealed by means of leaden seals. "Daylight" lamps illuminate the suite, thus giving a beautiful blue-white effect necessary for delicate experiments. The Laboratory suite is heated by gas-fires, the séance room having a special electrical heating device which will be described later. The floor coverings are of cork and linoleum, with a carpet for the séance room, if necessary. Negretti and Zambra (who are responsible for all the thermometric and barometric recorders) thermometers are in every room. The general and house telephones are situated in the office which is furnished with desk, etc., in the usual manner. The laboratory belonging to the Organisation is a well-lighted front room, 17ft. 4in. by 16ft. 4 in., with two windows, which can be seen in photograph (Figure 1). Wall benches round three sides of the room afford excellent working space for experiments. Bunsen and other gas burners are attached to connections at various points. A large glazed porcelain sink, with hot and cold water, adjoins the benches. Lighting is effected by means of two electric light points, but plugs (for lighting and power) are spaced around the room so that extra illumination can be employed, if necessary. Over the benches are shelves (some of which can be seen in Figure 2), bottles, instruments, etc. Cupboards, a large bookcase, drawers, a large teak table, 4ft. 6in. square (made specially for the laboratory), chairs, etc., complete the furniture. affixing two panels to the windows. This is useful when one is enlarging or doing any photographic process which necessitates much space. Every chemical likely to be required in photography or psychical research is to be found in the laboratory. A cherished possession is several pounds of radioactive red, green, and yellow sulphida of zinc (a special consignment from Paris) for luminous paint -a quantity probably exceeding that held by any institution in Great Britain. Glass-blowing apparatus, laboratory glass-ware, graduated measures, and the hundred-and-one odd pieces of apparatus which go to make up a well-equipped laboratory are to be found in the National Laboratory. The special equipment of the Laboratory comprises an electric heater for melting wax, etc., for experiments à la Kluski, chemical balances, electroscope, galvanometer, barograph, thermograph, and a maximum and minimum thermometer outside the window for comparison with interior temperatures. An air tester records - by means of the pulsations of a spirit bubble - the circulation of the air. A large copper still provides all the distilled water needed for photographic and other purposes. The bookcase contains a good collection of useful technical works, and volumes an modern psychical research. An assortment of luminous objects, musical toys, isolation chambers (for telekinetic phenomena), special tables, etc., are installed in this room. A wireless set is also available. The séance room, as alreadv mentioned, is separated from the laboratory by the baffle chamber. The room itself is the same size as the laboratory, but with one window only. During the séances a mahogany shutter on ball bearings is drawn across the window, thus excluding the light. The room is absolutely light-tight, ventilation being effected by specially designed shafts - properly baffled - leading into the chimney column. For heating the room an electric 1,000-watt radiator is installed. This patent radiator heats by convection, the air circulating across the deep fins of the heater. The electrical element is in contact with about a quart of water (which requires replenishing once a year) which it turns into superheated steam. A thermostat is enclosed in the radiator, automatically regulating the heat, which thus remains constant. The radiator reaches its maximum efficiency in a very short time. The room can also be heated by means of gas. graphing apparatus, copying, etc. A quartz mercury-vapour lamp for lighting with ultra-violet rays can also be employed, when necessary. A flash-light apparatus (with facilities for trapping the smoke) which can be fired mechanically or electrically is part of the séance room equipment. The room is plugged at eight points for light and power, thus affording ample accommodation for the various lights, heaters, dictaphones, etc. For controlling the lights and apparatus four Zenith resistances (1,770 ohms, 0.6 amps), tubular, with non-shock safety covers and switches, are included in the electrical outfit. The rheostats control the lights from "full on" to "blackout." They function (singly) from 60 to 100 watts, or up to 500 watts in series. Smaller rheostats are available for battery work. For recording the séances a complete dictaphone outfit has been purchased. The set comprises two recording machines, a reproducer, and a polishing machine. The dictaphone is essential when sittings are held in complete darkness and useful for note-taking in the light. In recording sittings with mediums who - like Stella C. - allow ample red light, a note-taker's table is installed. The table is of teak, with a lower shelf for rheostats, musical box, etc. It has four rubber-tyred pentagraph wheels which make it easy to move to various parts of the suite. To the top of the table is attached one of the dictaphones and two rheostats (which are controlled by the note-taker), and the note-taker's lamp, which is worthy of a detailed description. The specially-designed note-taker's lamp is really two lamps, with a three-way switch. It consists of a glass-topped box, at one end of which is an enclosed 20-watt lamp placed behind a slot to hold screens or filters of various colours. The interior of the box is enamelled white, with a curved reflector bottom. When the light is switched on, it passes through the red or other filter, and is thrown upwards, through the glass top, and through the paper upon which the notes are being made. If the medium or the conditions of the experiment will allow it, a turn of the switch lights another 20-watt lamp (also screened by red or other filters) which is supported upon arms overhanging the table. So it is possible to use a top light in addition to a transmitted bottom light - or either can be used alone. A third turn of the switch cuts off the current. For taking times a Zenith lever watch, with black face and luminous figures (minutes specially marked) is supported upon a gimbal rivetted to the bottom inside the glass box. The watch receives the red light from both - or either - lamps and is always under the eye of the note-taker. A silver chronometer, with split seconds, for timing pulse-rates and similar purposes is at hand if necessary. T he note-taker's lamp was made in Paris specially for the National Laboratory. A thermograph is installed permanently in the séance room. Should variations in temperature occur during a séance, it is highly important that data, giving the temperature of the room for some days previous, should be available. It is interesting to note that the séance room does not vary more than about two degrees Fahr. in a week. To, record the variations in temperature which take place during a séance a specially sensitive transmitting thermograph has been made by Negretti and Zambra from specifications supplied to them by Mr. Harry Price. The range of the thermograph is from 45 degrees to 75 degrees Fahrt. The temperature is recorded upon a large three-hour clock drum - it being assumed that no séance will last longer than the period mentioned. Charts can, of course, be inserted during the progress of a séance. The charts, which show a bold graph, have been specially lithographed and record the data of the séances for which they have been used. The thermograph has ten feet of capillary which is connected to a large enclosed mercury bulb (which is much more sensitive than the bi-metallic strip used an standard thermographs), so it is possible to record the temperature at various positions in the vicinity of the medium, the capillary being flexible. Readings to 1/10th of a degree Fahrenheit can be taken. Sound vibrations -which appear to be helpful in the production of phenomena - are supplied by means of the largest type of H.M.V. cabinet gramophone, and three musical boxes of various sizes. A large weighing machine is being installed. The furniture of the roam is very simple. Some chairs, a table, a settee and a cabinet are the normal equipment. The settee was made to a special design in anticipation of its use in cases of hypnosis. It is six feet long, extra wide, with one drop end. A subject can lie down at full length, as on a bed, in perfect comfort. It is upholstered in velvet corduroy, with two loose cushions. The cabinet, which can be seen in Figure 3, is a quadrant composed of two velvet curtains lined, an roller bearings, suspended from the ceiling by means of a special fitting. The cabinet is lined black inside (not shown in the photograph). slightest whisper in the séance room. This is accomplished by means of a microphone and thermionic valves coupled up to what is really a dictaphone unit. It is possible to broadcast séances anywhere. 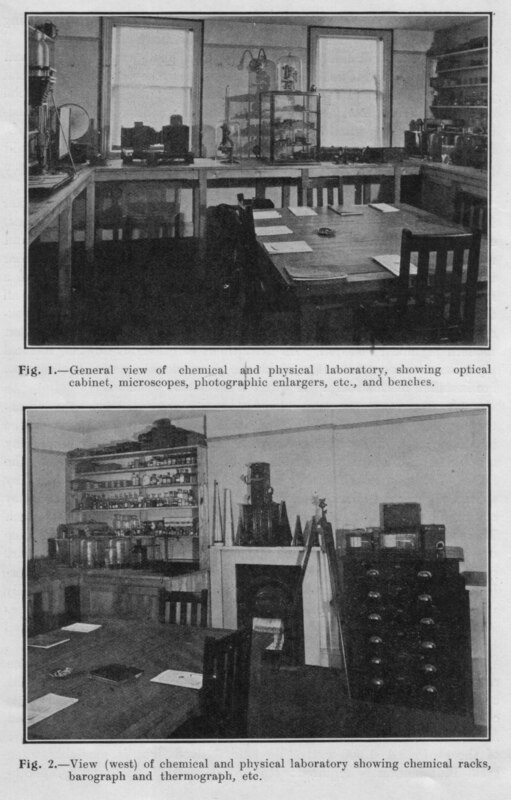 For developing plates and for minor photographic processes, the laboratory possesses a small, but model dark room, which is equipped with everything necessary. A 10in, by 8in. copper dark-room lamp with yellow, light red, deep red, and "Viridia" (for colour photography) Wratten filters is provided. A large lead-lined sink with water is available. Porcelain and enamelled tanks and dishes; racks, print-washers, measures, printing-frames, etc., are stored in the dark room. The lamp has a three-way switch so that red or (exterior) white light can be used at will. Materials for lantern-slide making are supplied. The optical equipment of the laboratory is particularly complete. There are seven cameras, viz., 1/1 plate, ½-plate, ¼-plate, two 2½ in. by 3½in. (one reflex), two 45 by 107mm. stereoscopic (one reflex). All these cameras have batteries of Zeiss lenses, which include wide-angle, copying, telephoto, enlarging, etc., etc. Three photographic enlargers belong to this section. One is a postcard automatic vertical enlarger. This instrument will rapidly turn out enlargements up to 18in. by 14in. from any negative (wet or dry) the size of a postcard or smaller. The second enlarger is of a different type and will produce enlargements (from a ½-plate or smaller) up to any size. The third enlarger is of the fixed focus variety, and will rapidly produce postcard pictures from half of a Verascope (45 by 107mm.) stereoscopic negative. For use with the stereoscopic cameras are five stereoscopes. The largest is an Ernamann automatic instrument which holds 100 45 by 107mm. glass transparencies, the changing being automatic. Smaller stereoscopes take the same transparencies. Two stereoscopes (one by Zeiss) handle the full size stereograms. The Laboratory possesses three microscopes. The most important is an ultra modern research model with extra large tube for photo-micrography. It is fitted with Zeiss apochromatic objectives and oculars, and the finest research work can be done with this instrument. The next in order of utility is the largest model Beck binocular, fitted with Zeiss, Leitz, and Watson objectives. This instrument is useful when a stereoscopic effect is required, and is suitable for use by the tyro. The third of the collection is a small working microscope. A large and very complete microscopical mounting cabinet, and a Cathcart microtome (for cutting sections), and a large collection of odd objectives and sundry apparatus useful in minroscopy completes this section. optical equipment. The principal is the latest model "Optiscope," a perfect instrument with many refinements. It will project a 15ft., brilliant picture 60 ft. with the 2,000 c.p. ½-watt lamp used with this lantern. A rheostat belonging to the outfit enables the instrument to be used with any voltage. At the lectures given by the National Laboratory a 9ft. opaque screen is used, a picture of this dimension being ample far the lecture hall of the Organisation. An extensive collection of lantern slides, and four complete lantern lectures ("Stella C." "Margery," "Willy Schneider," and " Facts, Frauds and Fallacies in Psychical Research") can be borrowed by members of the Laboratory. This account of the optical section would not be complete without mention of a very fine 5in. "crystal," a flawless quartz crystal sphere, true in every diameter to .0001". The art of crystal serving is not so popular as hitherto, but the perfect laboratory must be prepared for every phase of mediumship. The uninitiated, when viewing for the first time the magnificent workshop attached to the Laboratory, often express surprise that tools could possibly be used in psychical research. When it is pointed out to them that the construction, maintenance, and repair of apparatus, instruments, cameras, electrical equipment, etc., need every kind of tool, they realise the utility of the workshop. If there is one department in a well-equipped psychic laboratory which is indispensable, it is the workshop. The workshop (see Figure 4) attached to the National Laboratory of Psychical Research contains every tool and gauge necessary for the construction and maintenance of scientific apparatus. Turning, brazing, casting, forging, grinding, polishing, etc., can all be carried on in the workshop by a competent person. Two lathes are installed. The larger, a 4½ in. screw-cutting model, with 6ft. gap bed, is capable of handling really heavy work. Sets of wood-turning and wood-carving tools are available, and the large lathe can be used for turning wood. The smaller lathe is for fine precision work. Every kind of screw can be made or duplicated by one of the many sets of stocks and dies, and stocks of all the principal screws are held. Metal, wood, various kinds of wires, plugs, adaptors, and other electrical equipment are housed in the workshop. The fittings comprise a 7ft. by 3ft. by 2 in. bench, with a 4 in. Parkinson vice and two small vices. Over the bench are sets of shelves for the tools. Two cupboards contain sets and cases of gauges and tools and new material. Power for the large lathe is available, if necessary, and gas for the forge, brazing jet, soldering stove, etc., is laid on. The workshop is self -contained, and a person with the requisite skill could shut, himself up in this room and construct a complete scientific instrument. Enough has now been said to give the reader an insight into the scope, work, and equipment of the National Laboratory of Psychical Research. The photographs will help to give some idea of the general appearance of the principal rooms of the Organisation. The Council cordially invite any reader of this Journal to inspect the Laboratory and its equipment - an installation which has been valued at three thousand pounds sterling.